(PhysOrg.com) -- An unusual meteorite with an interesting orbit has been tracked to the ground using a photographic observatory that records time-lapse images of fireballs traveling across the sky. The network of cameras is in the Nullabor Desert in Western Australia. It allows scientists to track a fireball path, formed by a meteorite as it travels through Earth's atmosphere, and then work out where the meteorite comes to rest. The fireball camera network project was set up by Dr Phil Bland from Imperial College London and scientific associate of the Natural History Museum, along with colleagues from Ondrejov Observatory in the Czech Republic, and the Western Australia Museum, in 2006. This is the first meteorite recovered using the network. The cameras recorded the fireball that ultimately produced the meteorite in 2007, and the fragments that fell to Earth were named Bunburra Rockhole after a local landscape feature near to where they landed. 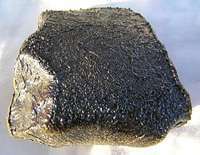 The meteorite was found within 100m of the predicted fall line. It was collected and samples were given to the Natural History Museum where mineral experts Dr Gretchen Benedix and Dr Kieren Howard helped examine and classify it. They produced data about the meteorite’s composition and the types of minerals within it. Most meteorites found on Earth are believed to be fragments of asteroids - ancient rocks that formed during the creation of the solar system about 4.56 billion years ago. Using complex calculations, the team were able to work out the meteorite's path to Earth and its orbit, and from that, where in the solar system the meteorite most likely came from. The Bunburra meteorite is about the size of a cricket ball and is an unusual type of basaltic igneous rock. Most basaltic meteorites are thought to come from one asteroid. However, the composition of Bunburra Rockhole means that it comes from a different asteroid. This means that the process required to form this type of rock was happening in more than one place in the early solar system. ‘It's vital to have a meteorite with information about where it comes from in the solar system,’ says Dr Benedix. ‘We've known for a long time that most meteorites are from the asteroid belt, but we don't know exactly where. This kind of information helps us fit one more piece in the puzzle of how the solar system formed and evolved. The team says that the meteorite had an unusual orbit. Using modeling techniques, it was determined that Bunburra Rockhole began as part of an asteroid in the innermost main asteroid belt between Mars and Jupiter. Its orbit gradually evolved into one very similar to Earth's. Other meteorites for which data exist have orbits that take them into the main asteroid belt. Dr Howard says, ‘I consider myself lucky to handle rocks from space when usually I only know that they come from the curators’ cupboard! Dr Bland concludes, 'It was amazing to find a meteorite that we could track back to its origin in the asteroid belt on our first expedition using our small trial network. This meteorite could just be a small chunk that broke off the bigger asteroid at some point millions of years ago. That photo is not an example of time-lapse photography. It is called a long exposure. Time-lapse is when multiple photographs are recorded at intervals of time in order to 'speed up' events that take too long for the human eye to perceive. The geology of the Nullarbor Plain, its flat terrain making fallen meteorites stand out, is the perfect location for a meteor network such as this one. Glad to see some early payoff.